I had got stuck with Elizabeth, I couldn't find her parents. Then, when I was researching James' brother, William, I discovered his first wife was Mary Grimshaw who turned out to be the twin sister of Elizabeth. 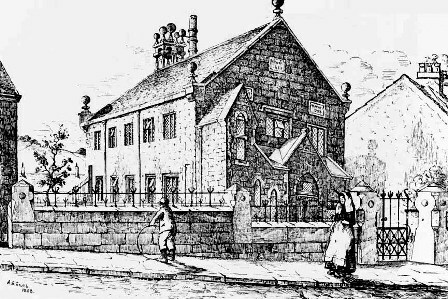 Both were baptised on the same day: 1st August 1813 at St Mary the Virgin, Blackburn; their parents are John Grimshaw and Ann Preston, both Elizabeth and Mary have Blackburn as their abode, the occupation of John, their father, was weaver. 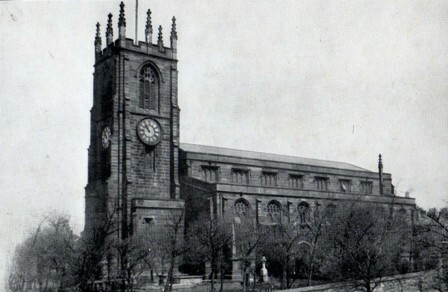 Both women get married to Wards and both marriages take place at St Mary the Virgin, Blackburn. Elizabeth is the first to marry, James Ward, on 14th August 1831. Mary marries William Ward, who is the brother of James, on 1st January 1832. Joseph Fairbrother is one of the witnesses at both marriages. I think there are too many coincidences for them not to be twins. This image was provided by Gordon Hartley for use in the Cotton Town digitisation project. Richard (1833-1906) was born on 16th August 1833 and was baptised at Lower Chapel Independent, Over Darwen, on 27 August 1833 by Samuel Nichols. Jane (1834-1910) was born on 21st December 1834 and baptised at the same chapel by Samuel Nichols on 8th December 1835. Alice (1856-1915) was born on 19th October 1856 and baptised at Lower Chapel Independent, Over Darwen. It is highly likely they were all baptised at Lower Chapel Independent but for some reason there are no baptisms recorded from 1838 to 1852. In the 1841 census the family are living in Bury Fold; James is 30 and a labourer, Elizabeth is 25, Richard 7, Hannah 3, Jane 5, John 1. In 1851 they are still living in Bury Fold but James is now 42 and a quarryman; Elizabeth is 38, Richard is 17 and a spinner, Jane is 15 and a power loom weaver, John is 11 and a spinner, William is 8, Ann 5, James 3, Mary 1. Hannah is no longer there as she died in 1842. Elizabeth and James had also lost another child, Mary who was born and died in 1849. James senior dies in 1858 the same year that his youngest child, Elizabeth is born. He is aged 51 years and leaves behind Elizabeth and their 9 children. In 1861, Elizabeth aged 50, is still living at 27 Bury Fold with her son, Richard 27, cotton spinner, Jane 25, Ann 15, both cotton power loom weavers, John 21, William 17 both cotton spinners, James 15 is a creeler in a cotton factory, Mary 12, is a cotton weaver assistant, Elizabeth 8, Alice 5. And here is a link to a Green Trail which shows that the Printing Shop was up Bury Fold. It seems likely that this is where the Ward family lived and where most of the children were born. Details from the Trail tell us that the printing shop was built in c1791 by James Livesey as a water-powered carding and spinning mill. Calico printing was begun c1810 by Robert Livesey. Calico printing ended in 1835 when the premises were bought by Eccles Shorrock and converted into cottages. There were two mills near Bury Fold at this time, the Bowling Green Mill and, further down Bolton Road, Darwen Mill. The old Bowling Green Mill was pulled down and new Bowling Green Mills were built on the same spot, but these have all gone now. It is possible that as the Bowling Green was nearest to Bury Fold, the family all worked there. However, it is also likely they worked in Darwen Mill which later became known as India Mill. Darwen Mill was built by Eccles Shorrock who owned the cottage where the Ward family lived. 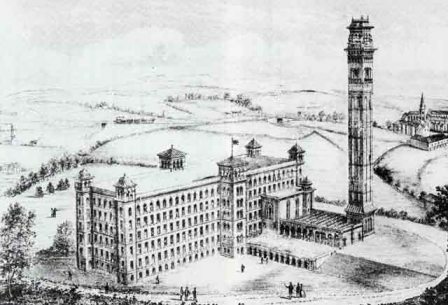 Darwen (India) Mill, by Evan Leigh of Manchester, 1873. This is an interesting drawing because the church on the right must be St Johns. There doesn't appear to be a Redearth Road yet, although this could be the artist idealising the new mill. For several generations the Ward family lived not too far from India Mill, either in front or to the right or at the back, including up to my childhood when you could see India Mill from the back bedroom window of 80 Redearth Road but, of course, by this time it was surrounded by rows upon rows of terraced houses. 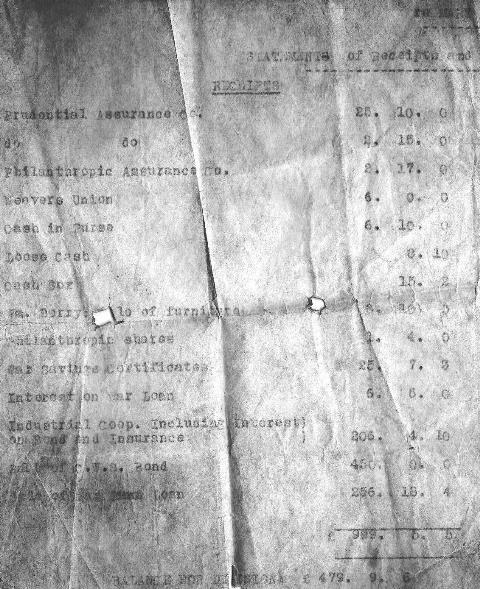 Provided by the copyright holder for use in the Cotton Town digitisation project. Cotton Town. The Factory Act of 1833 banned the employment of children under 9 years old and the working week for children aged 9-13 was limited to 48 hours per week. In 1844 the half-time system was introduced which meant that some children attended school half-time whilst the other time they worked in factories. By 1921, 12-year-olds were no longer allowed to work in factories for half a day every day. For more information see Cotton Town. By 1871 the family had moved from Bury Fold to 503 Bolton Road. 503-505 Bolton Road is now a Bargain Booze shop! Elizabeth is 59; her daughters are all spinsters: Jane 35, Mary 21, Elizabeth 17, and Alice 14 all are cotton weavers. Her son, John, aged 30, is a widow, is also living with Elizabeth, as is his step-son, John 9, son, Thomas A., 2 and daughter, Mary, who is one month old. There is also a boarder, Caroline Bromley who is 20 (perhaps Richard's wife's sister?). John married Mary Hall in 1863 at Blackburn Registry Office; she already had a son, John who was born out of wedlock and was christened with his mother's name, Hall. Thomas Albert is born in 1868 followed by Mary in 1871; both are born in Darwen. It seems likely that Mary died giving birth to her daughter, Mary. I cannot find an Elizabeth Ward in Darwen in the next census so I searched deaths and there is an Elizabeth Ward who died, in Darwen, in 1877 aged 64 years - this looks like it is our Elizabeth as there are no other Elizabeth Wards from Darwen who died around this period. This needs confirming by her death certificate. Richard (1833-1906) marries Sarah Bromley at Blackburn Registry Office in 1867. He is about 34 when he marries; Sarah is about 31 and she comes from Shropshire. Richard was a cotton spinner all of his life. Richard and Sarah had 5 children but only 3 were still alive in 1911: Mary Alice born in 1870; Sarah Elizabeth, 1872 and Frederick, 1878. In 1871 they lived at 22 Gladstone Street (my cousin Tommy Turnbull, son of May Ward, grand-daughter of Richard's brother, James, also lived in Gladstone Street many years later). They were living at 10 Tythebarn Street in 1881 followed by 13 Longton Street where they lived when Richard died in 1906 at the age of 73 years. All three children were cotton weavers. In 1911 Sarah is still living in Longton Street with her two daughters, Mary Alice who is 41 and Sarah Elizabeth who is 39, both are spinsters. Sarah died age 78 years in 1913. John (1840-?) remarries in 1876, his wife is Ann Robinson, a widow whose maiden name was Moorhouse. In 1881 they are living at 24 Aston Street. Ann is 41, John is 40, and a cotton spinner and his son, Thomas Albert who is a cotton weaver. Ann's mother, Elizabeth Moorhouse, a widow who is a housemaid is also living there. Ann was born in Sabden. Mary, age 10, is living with her aunts Jane, Mary, Elizabeth and Alice at 18 Grimshaw Street. In 1891 John and Ann are living at 17 Ashton Street. Thomas Albert appears to have stayed single for in the 1901 and 1911 census's he is a boarder with a family called Rainford (bakers) and is living at 151 Duckworth Street. William (1843-1862) died when he was 18 years old. His death certificate tells us he died of dropsy (heart failure). He was living at the Printing Shop at the time. Ann (1846-?) Ann married John Yates at Holy Trinity on 4th October 1868. She is living in Bolton Road, probably with her mother and siblings at number 503. She is 24, a weaver and, of course, her father is James Ward. John is 30, a widow, works as a spinner and lives in Isherwood Street. His father is Robert Yates, a labourer. The witnesses are George Fawcett and Catherine Yates, I assume the bridegroom 's sister. Holy Trinity (now St Peters) is just round the corner from where I lived for a time in Nancy Street. Many members of our family have had their burial service here. In 1871 Ann and John are living at 7 Hills. They have four children: Nanny, 8; Robert, 7; Samuel 3; and Ellen, 1. John is a spinner, Ann a weaver. By 1881 they have moved to 3 Hannah Street (me and Stephen used to play on Hannah Street when we were children, it is just round the corner from where we lived in Redearth Road). John is 42 and a spinner like his son, Robert who is 17. Ann 36, is a weaver, as are her daughers Nancy, 18 and Ellen 11. Samuel, 13 is a drawer; and the family have been extended by Catherine 7 and Ann J. 4. By 1891 the family have moved to 22 Franklin Street. John is 52 and still a spinner; Ann is 45. I'm not too sure what it is that Samuel, age 23, is doing, it looks like twister? cotton. Ellen 21, Catherine 17, Ann J. 14 are all cotton weavers; and the family have a new addition, Blanche E, 9. It is possible Ann died in 1892 as there is an Ann Yates who, according to Lancashire BDMs died that year in Darwen aged 47 years and she doesn't appear again in census records. Jane (1834-1910), Mary (1849-1921), Alice (1856-1915), Elizabeth (1858-1917) After their mother, Elizabeth, had died in 1877, the four sisters, Jane, Mary, Alice, and Elizabeth moved to 18 Grimshaw Street. Their brother, John, had remarried and his daughter, Mary, who was now 10 years old, had been living with her grandma and aunts and clearly stayed with her aunts when they moved. The sisters were all unmarried and all cotton weavers. Here is a link to Spring Vale Methodist Church website which includes an article describing the area in the 19th century. By 1891 they had moved to 5 Dewhurst Street; their niece is still with them but she has left by 1901 and I'm not sure what happened to her after that. The sisters are still at this address in 1911, although Jane had died the year before aged 75 years. They all remained spinsters and cotton weavers, although by 1911, Mary is keeping house whilst her sisters are working. Mary is 58, Elizabeth 50 and Alice 47. Alice dies on 18th July 1915, at the same address, she is 58 years old. She leaves £317 3s to her sisters, Mary and Elizabeth. Elizabeth is 64 when she dies on 15th October 1917. She leaves £483 5s 11d to her sister, Mary. There is some confusion over Mary's death. There is a Mary Ward who died, aged 71 years, on 29th April 1921 and lived at 38 Hannah Street. This Mary Ward left £813 18s 9d to John Aspden, mechanic. In essence, Mary left just short of £1,000. 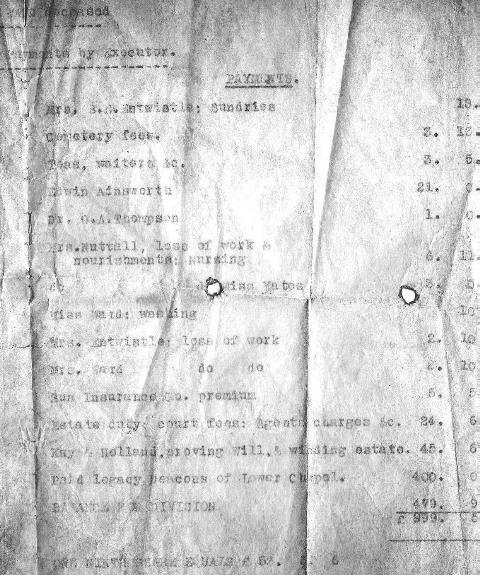 £400 was left to the Deacons of Lower Chapel, just over £125 was paid for expenses whilst the remainder was divided between nine people; my grandad, Joseph Ward, was one of them; they each received £59 5s 6d. The last time I went to look at the graves behind Lower Chapel it was very difficult to read them and the building looked to be in a sorry state.